Bundled up for the day down the waterway. We report on the first leg of our journey from Beaufort, NC (pronounced BO-fort) to Beaufort, SC (pronounced BU-fort). 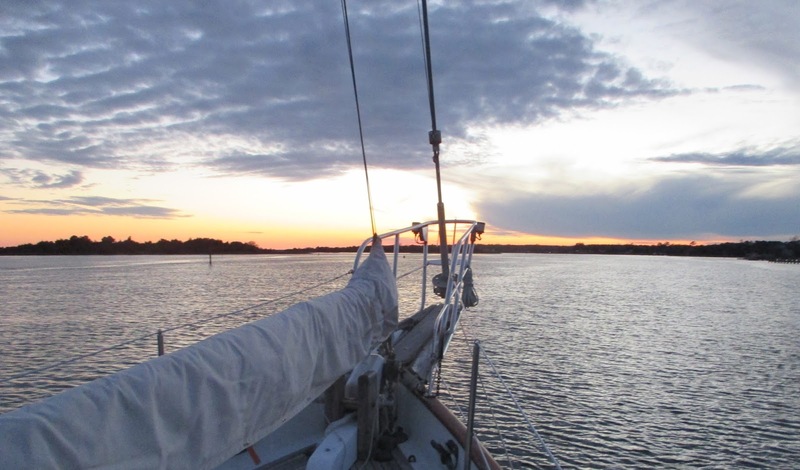 We left our anchorage in Morehead City, NC on 20 January, with high temperatures in the 40’s. Sunny, but cold, cold, cold. We made it to Mile Hammock Bay near Jacksonville, NC just in time to wait out the winter storm Jonas, trying to keep warm with long underwear, several layers, hats, blankets, the propane heater and oven, and hot water bottles. Did we tell you our journey started off COLD??? 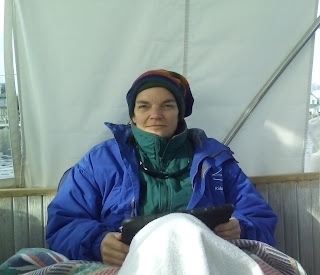 Hanging out in the cockpit with long underwear, jeans, sweatpants, turtleneck, sweatshirt, two coats, two blankets, and a hat. Popping up after turning on the oven to warm up the cabin. Some mornings you just want to stay in bed. Cold days on the waterway, especially. Some mornings you are rewarded for your efforts to get up. The sun rises and sets everyday – we tend to forget that. Living “outside” helps remind you. Sunset at our first anchorage of the journey in Swansboro, NC. Sunset at anchor in Mile Hammock Bay, NC. Sunset on a mooring in Carolina Beach, NC. We are adjusting to our life back on the boat. Some of it is easy and fun. Some of it, well, tries our patience. We need to work on that. 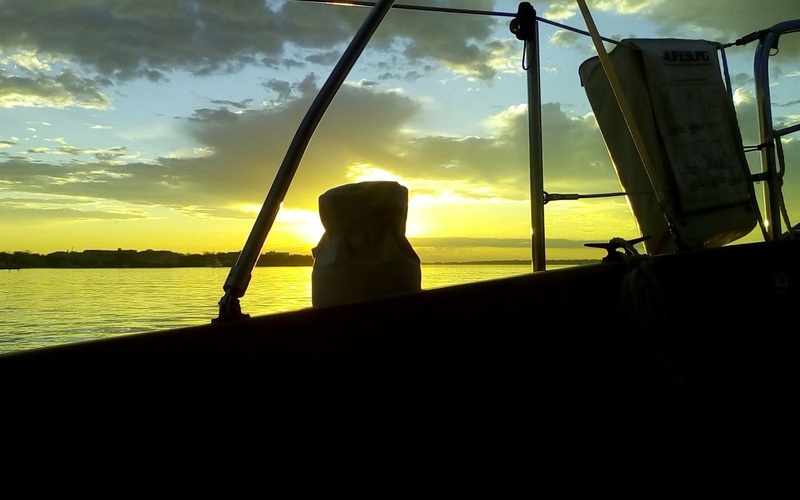 One easy and fun thing is laying in the berth listening to the quiet of the water lapping the hull and the gentle rock of the boat in a calm evening. Among the things that always challenges the patience are the things that break, and break again, and demand that you fix them now. We made it to Charleston, SC on 30 January, just in time to enjoy a warm spell with temperatures reaching into the 70’s. Last time we headed south to Charleston, we were welcomed with a warm spell in the 80’s. Charleston has been good to us. Today we are moored in Beaufort, SC with temperatures in the 50’s, waiting for a rain front to pass through. Winter in the Southeast, just like Forest Gump’s box of chocolates, you never know what you are going to get. Sunset anchored in Charleston Harbor, SC. Sunrise at anchor in Charleston Harbor, SC. Much has been said and written about going down the “ditch” traveling the Intracoastal Waterway. Some say the first time is not to be missed. The second is tedious and the third time is horrid and something to be missed. On any one day we may have all of those sentiments. It can be complicated on the waterway. Yesterday was one of those days. The day started as we delayed our departure to time our passing through difficult cuts (man-made passages through the marshes) with a rising tide. Nevertheless, in some areas we had no more than six inches of water to spare under our keel! Following the shoaling challenges, we entered the broad exposed water of St Helena Sound with the full force of 30 – 40 mph winds. After the rough sound crossing, we snaked towards Lady’s Island Bridge in Beaufort, SC to request the last bridge opening before car traffic rush hour would close the bridge for two hours. The last challenge was to discover that things had changed in the anchorage since we were here last. The area was now a mooring area with a very tight field, which meant we had to wiggle in beside other boats while maneuvering in gusty winds and contrary currents. The day ended with a rum drink in the cockpit while watching a sandpiper munch on critters on our mooring line. I heard it said that a wise man understands that most of us actually do get everything we want – we just don’t get it all at the same time. You should be happy with that. We are.